London as a town, city, and major port was established by the Romans almost 2,000 years ago but settlements have been there for something like 6,000 years. To say London has experienced everything probably isn’t even an exaggeration. It survived the plague, tyranny, many wars, and it has survived a lot of growing pains. It is a city full of history, knowledge, and experience. Not only is it easy getting around London but it is a city with convenient options. Getting to London is actually quite easy. Most airlines offer deals if you watch for them. Last time I flew with WestJet but I have also flown with Airtransat, Air Canada, and Lufthansa to name a few. London is one of the major hubs for travel in Europe so no matter where you are flying in from, it’s very accessible with flights all day to any of the five major airports. London Heathrow is the largest. It’s so massive, it’s actually one of the busiest in the world. I prefer Gatwick myself though. It’s the second largest in the UK so it is large but just not as humungous and chaotic as Heathrow. Skyscanner (affiliate link) can help you find the best price. London is a really large city that is really old, so therefore has heaps of experience and knowledge. They’ve been doing public transportation longer than some countries have actually been countries. While this means all airports are easily accessible, it also means there can be delays and problems. All something I know from personal experience. It once took me like three hours to get from south London to Stanstead Airport because of a train breakdown and construction. Thankfully I had given myself a lot of extra time. Getting to and from each airport is quite easy though. I know there are buses, car rentals, and taxis but the following information is for the train. My favourite choice based on cost, speed, and efficiency. Gatwick (website) is south of London and the best-connected airport with trains, making it very easy to access from all over England. The train station is conveniently located in the airport and the Gatwick Express runs a 30 min service to London Victoria station with trains leaving every 15 min. Thameslink has trains that go to other London stations but the trip does take a bit longer because there are other stops. You could also catch a Southern train to London Victoria but again, it will take just a bit longer because it has other stops. Your Oyster card (described below) can be used on all trains to and from London and Gatwick airport. Heathrow (website) has trains and the Tube option. Also because Heathrow has several terminals you have to watch which stop you need to get off at. Heathrow Express is the fast, non-stop, train journey taking you to Paddington station in London from Terminals 2 & 3 as well as Terminal 5. For Terminal 4 you will need to catch the free transfer train at Terminal 2 & 3. There are 4 transfer trains per hour and the ride is approx. 6 min. Heathrow Express departs every 15 min. Your Oyster card (described below) can’t be used on the Heathrow Express. There is also the TfL Rail which has several stops between Heathrow and Paddington station so it takes longer. At Heathrow it stops at Terminals 2 & 3, and Terminal 4. For Terminal 5, you will have to get off at Terminal 2 & 3 to jump on the free terminal transfer train. There are 4 transfer trains per hour and the ride is approx. 6 min. The TfL Rail departs every 30 min. You can use the Oyster card with this train service. The Tube (underground subway system) has three stops at Heathrow heading to and from London on the Piccadilly line. Terminal 2 & 3, Terminal 4, and Terminal 5. The Terminal 2 & 3 stop is between both terminals but there is an underground pedestrian walkway. You just need to know it will add time and walking distance. The Tube runs approx every 10 min. and it is the cheapest way to London from Heathrow, but it does take a bit longer depending on which station you are travelling to and from. You can use the Oyster card with the Tube to and from Heathrow. Luton (website) is north of London and easily accessible by train. It’s actually the same line as Gatwick but in the opposite direction. It’s a little less convenient because the station is not right at the airport but there is a shuttle bus (approx. 10 min journey with trains every 10 min) to catch so it is still easy. If you choose Luton Airport as your station when you are purchasing a ticket to the airport, the shuttle bus is free. If you purchase a ticket to Luton Parkway, you will have to pay for the shuttle bus service (cash only). The train goes all the way south to Brighton so there are a few London stations it could stop at including St. Pancras International station. You can’t use the Oyster card (described below) for your ticket between Luton Airport and London (ex. St. Pancras International). Catching the Stansted Express between Stansted (website) and London is very easy, the station is located at the airport. Mon, Fri, & Sat the express train to the airport also starts leaving London Liverpool Street station at like approx. 3:40 am. Trains depart the station every 15 minutes and the trip to the airport takes about 45-50 min. You can’t use the Oyster card (described below) with the Standsted Express. In my opinion, as far as major cities go, getting around London is one of the easiest. You don’t even have to rent a car, the public transportation system is awesome. It covers most of the city, is affordable, and it is easy to navigate. A lot of tube stations have help desks if you are a bit confused. There are also giant maps on the wall to help you, as well as small paper maps for you to grab and carry with you. Or print yourself a map before you leave home (Transport for London Tube Map website). You can buy single trip tickets each time, purchase a one-day Travelcard, or buy the Oyster pay-as-you-go card. 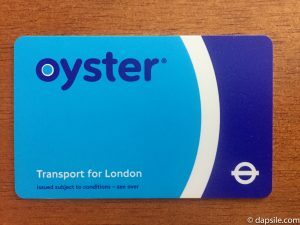 It depends on how long you will be in London, where you plan on travelling to, and what form of transport you will be using, but the Oyster card is simple, convenient, and the cheapest option. It can be used on the bus, Tube, tram, DLR, London Overground, TfL Rail, Emirates Air Line, River Bus services, and most National Rail around London. You pay a deposit for the Oyster card, then load it up with money to be used for your travels around the city. You will receive the deposit back if you return the card and you will also be refunded if your balance is £10 or less. With the card, the cost you pay for a 24-hour period from 4:30am to 4:29am on all travel, is capped. The cap value depends on the mode of transport but it makes things more affordable and you don’t have to know in advance what zones you will be visiting. Here is the website for information on tapping in and out (paying) because it is different depending on your transportation choice and you do not want to be fined or pay extra for your trip. I picked up my Oyster card like seven years ago and I’ve kept it to use each time I go back. You can even buy a visitor Oyster card (website) online before you leave home and have it sent to you. Makes arriving and getting around London using the public transportation a bit easier with one less thing to worry about. One of the first things I did when I moved to London, and what I usually recommend people do when they visit, is take the Hop-On-Hop-Off bus tour. It not only points out the sights and gives you a commentary on things you would probably miss or not learn if on your own, but it also provides transportation to each of these tourist sites for a time period of your choice, starting at 24 hours. It’s a great way to get your bearings and help in getting around London. 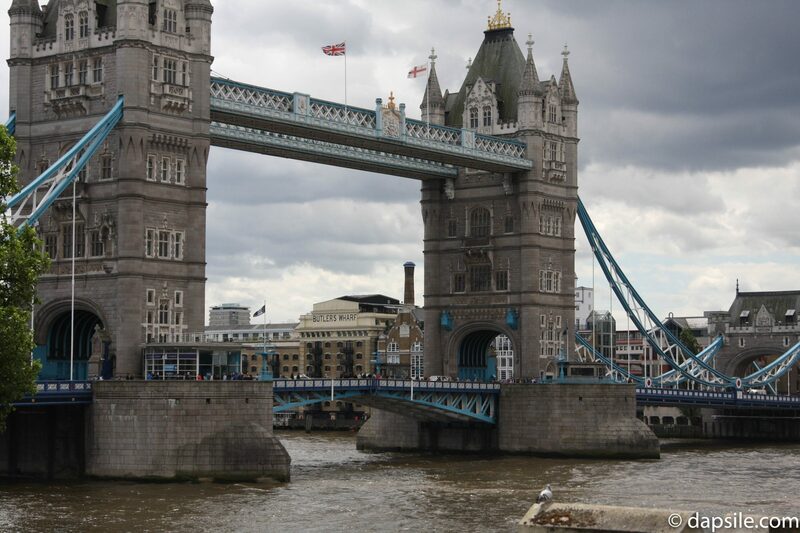 You can use this affiliate link to purchase The London Pass which not only gives you a FREE 1-day Hop-On-Hop-Off Bus Tour ticket but also FREE entry to over 80 attractions, museums, and tours. Plus, fast track entry at some of them. It could save you money and stress if works with you plans. Also, a lot of touristy sights are located rather close together, within walking distance actually. It’s kind of hard to tell on a map but Piccadilly Circus, Leicester Square, Trafalgar Square and Covent Garden are all within a short walk of each other. It makes getting around London even easier. Plus, there are so many places to eat, drink, and shop along the way. We stayed in Airbnb’s for the 2016 European Museum Tour and London was the best one out of them all. It was a newer, small studio but it used the space very well. There was a living room, kitchen, bathroom and a bedroom alcove. The only reason this was probably classified as a studio is for the lack of a door on the bedroom. It also had a washer and dryer so we could continue our trip without stinking. We lucked out finding a great place with a great host, we never had any problems contacting him. There was even wine waiting for us when we arrived!